Prince Harry and Meghan Markle are getting married this spring – May 19th to be exact – and so are a lot of other fabulous couples. Are you invited to a wedding and having anxiety about the right wedding attire? Whether you’re the mother of the bride, the college best friend or the date of a guest, everyone worries. Not wonders, worries. Even men are confused about what to wear now that dressing up has more to do with dressing down. And the invitations and definitions of what’s appropriate aren’t always crystal clear. The answer can usually be found somewhere on the invite, so go get that heavy envelope, pull out all the papers and look through it. If the dress code is stated, then hooray! If not, look for clues based on location and time of day. Is the ceremony in a barn at sunset or a church or synagogue at noon? Are you going to Italy for a celebration at a Tuscan farmhouse starting at 4:00? Or are you going to New York City Hall at 10 and a restaurant nearby at noon? Even the colors, font and weight of the stationary will give you ideas. It can be sort of alarming overall but what if I said, I can take the stress off your shoulders!? I review your event and invite, plan your outfits for your role, analyze items by cost-per-wear, take pictures and make notes for your outfits, and even pack you up so you arrive without wrinkles or in a jumble. 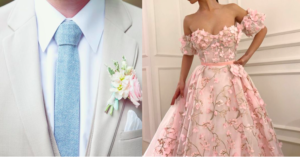 If you feel confident about going it on your own though, here’s a list of levels of dress along with tips on what to wear for wedding attire. This will be a lavish affair and is the most formal of all event types. Women wear floor-length ball gowns. Men wear a black tailcoat over a white starched shirt with a white waistcoat and a white bow tie worn on a wing collar shirt. Men wear tuxedos and women wear formal evening gowns, normally floor-length. This is less opulent than white tie wedding attire but still very dressy. Black tie for men consists of a tuxedo in black or midnight blue, a jacket without tails and matching trousers, a cummerbund or vest, a white shirt with a wing collar shirt and a black bowtie. Black Tie Optional means tuxedos are encouraged but dark suits and ties for men are just fine. Women wear formal gowns of any length. If in doubt about how dressy to be here, I recommend more formal than less. It’s better to be a little overdressed because it shows your respect and care for the couple’s big event. Women wear a cocktail dress. Men wear a suit (or an elegant sport coat and pressed trousers) with a button up shirt and a tie. Even though this isn’t formal wedding attire, make sure you’re accessorized, wear colors and patterns that are appropriate, be perfectly groomed, tailored and pressed. Beach weddings aren’t necessarily casual events unless that’s been stated. If it’s beach formal wedding, women should wear a party dress and dressy flats. Men wear a summer suit with a linen shirt and tie. For this type affair, think dressed-up casual. For women, wear a party dress or an up-to-date and fashionable outfit (not a cocktail or evening dress because it’s too dressed up). Men wear dress pants with a button up shirt and a sport coat. The instructions above are worth repeating: to really dress well for casual, make sure you are accessorized, patterns and colors are on point, perfect grooming, tailored and pressed. It’s best to avoid wearing a white dress. Let the bride have her shining moment. Gentlemen, skip the boutonniere to avoid confusing yourself with the wedding party. Carry a clutch or a slim shoulder bag. A clutch should have a strap so you can put it over your wrist during cocktails. Metallic bags, vintage options and animal prints add a bit of chic to your look. Make sure your bag works with your dress and don’t leave this to the last minute. It’s really a drag when you don’t have the bag. Avoid “cocktail hand” and hold your beverage in your left hand. This leaves your right hand ready to shake hands when you meet someone new without having a wet and cold grip. Gentlemen, check the weather and bring an umbrella for your partner. Also, nothing says hero like the guy who has a handkerchief to hand over to the weeping mother of the bride. It’s a lost art that’s ready to be revived. Think through your shoe choices. If there’s lots of dancing after dinner, be ready to kick off your heels and slip on your comfy flats. If the wedding is outside, wear a wedge or a flat to the ceremony and switch to a heel for a more formal reception. Make sure you have the proper undergarments to go with your dress. There’s nothing so disappointing as a perfect dress that doesn’t fit or flatter. I would be overjoyed to help you prepare for a wedding no matter what your role will be. Give me a call or email me at kerry@thefirstlookimage.com and we’ll start to plan right away!